I kinda wanna include more thoughtful posts to my blog. As a human being, I tend to have quite a lot of thoughts so why not document a few! My usual blogging schedule is every Monday, Wednesday, Friday and Sunday and I have the idea to squeeze in an extra, more thoughtful post some Thursdays. The first in this 'series' is going to be about gratefulness. I firmly believe that in order to attract positive things to us, we have to recognise and be grateful for the things that we already have. 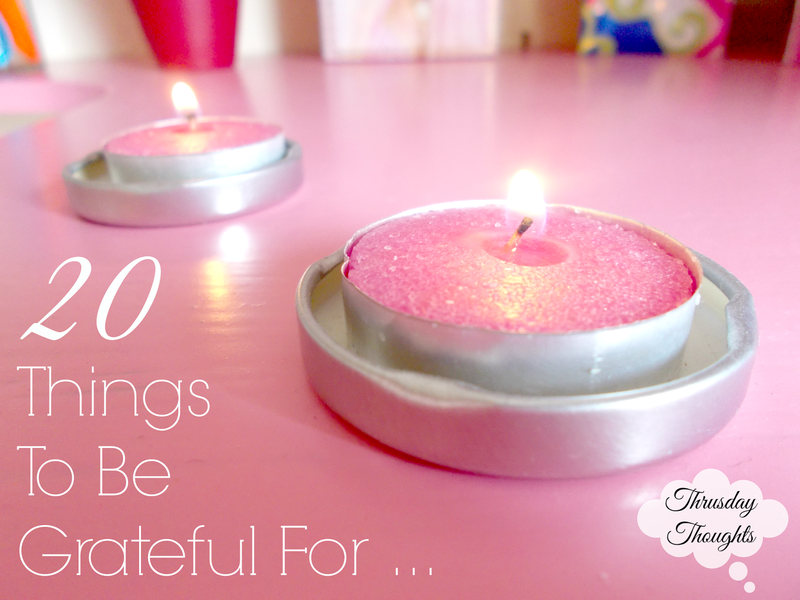 Here's a list of 20 things we can all be grateful for, even when things don't seem to be going our way! 1) The fact you can watch 20 minute long compilations of dog vines. Search it. 2) The thing that makes you different. 4) The person who makes you happy. 5) The bargain you just bought. 6) There are more countries you can discover and explore. 7) The magic of a good book or film. 8) Your passion, whatever it is. Think about it. 9) The ever-flowing wealth of visual inspiration that is Pinterest. 10) Slippers, after wearing heels all night. 11) Being on time for something. 12) Time to reflect. If you don't think you have it, make it. 13) Doughnuts, salads, pizza, strawberries, ice cream; food. 14) Obstacles. You've had to jump a lot of hurdles and dodge a lot of obstacles but they're what are guiding you in the right direction! 15) Your freedom to create. 16) Having the confidence to say yes. Or no. 17) That person that listens to you. 18) That outfit you always feel good in. If you haven't found it yet, it's out there! Oh, and there may be more than one! 19) The things that make you laugh everytime. 20) And finally, the fact that you have things you can be grateful for. I think that in itself is something! So those are just some things you can be grateful for! There is an infinite number of other things too so I'd love you to get involved in the comments below!